THE EUROPEAN COURT of Justice has ruled that a Scottish plan to introduce minimum pricing of alcohol is illegal. The court was responding to a case brought by the Scotch Whisky Association (SWA). The SWA had taken a legal challenge against legislation passed by the Scottish government which would have set the minimum price per unit (MUP) at 50p. Today, the court ruled that the Scottish law would restrict the market. The Court of Justice considers that the effect of the Scottish legislation is significantly to restrict the market, and this might be avoided by the introduction of a tax measure designed to increase the price of alcohol instead of a measure imposing a minimum price per unit of alcohol. The court said that while it was legal for a country to have its own rules around a market, such rules had to be “proportionate”. The Court states that the fact that that measure prevents the lower cost price of imported products being reflected in the selling price and that the legislation is thus liable to impede access to the UK market of alcoholic drinks produced in other Member States is sufficient reason to conclude that the measure constitutes an obstacle to the free movement of goods. The court noted that the measure was designed to tackle alcohol problems in Scotland, a “less restrictive” tax measure should be pursued. The matter will now return to the Scottish courts which will make the final decision. The Irish government recently announced similar plans to Scotland’s and the ruling leaves its planned measures open to a legal challenge. The plans set a minimum price on alcohol of €1 a unit. Reacting today, Health Minister Leo Varadkar said the Attorney General and officials in his department would study the implications of the judgement. But he indicated that Ireland will proceed with the measure. “The Irish Government knows that a strong and convincing case can be made in favour of MUP over other measures,” Varadkar said in a statement. We believe that MUP is a proportionate measure and the only measure that would effectively target the widespread access to alcohol that is very cheap relative to its strength. “This was backed up by the research conducted by Sheffield University which showed that MUP changes behaviour in those most at risk. He said the recent Healthy Ireland survey provided more evidence that Ireland has an alcohol problem that needs to be tackled. He said the Sheffield University research showed that minimum unit pricing is the most effective way to address harmful drinking. 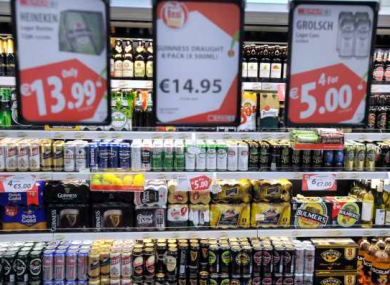 Email “Minimum pricing for alcohol could be illegal - but Ireland's pressing ahead”. Feedback on “Minimum pricing for alcohol could be illegal - but Ireland's pressing ahead”.